Has your dog been itching more than usual? Do you suspect your dog might have fleas but you’re not sure what to look for? If so you’ve come to the right place. Here’s how to check your dog for fleas at home. Do You Think Your Dog Have Fleas? Every time I see my dog itching I can’t help but ask myself the dreaded question; does my dog have fleas? Luckily most of the time it’s just some regular itching, not itching caused by fleas. But every time I see her itching more than usual I do a quick inspection for fleas just to make sure. It’s one simple way I can ensure I’ll catch a flea (or tick) problem early. Routinely checking your dogs skin and fur is one of the easiest ways to catch a flea infestation early, before it gets out of control. The great thing about doing home checks on your pet is that it’s easy to add right into your regular grooming routine. Checking your dogs skin and coat regularly can also help you catch other potential changes or concerns right away. The earlier you catch a flea infestation the better. Fleas multiply extremely quickly — catching them early before the population grows is key. Fleas also cause a lot of discomfort for dogs, and the longer an infestation goes on the likelier it is that they’ll end up suffering from flea related health conditions and diseases. If you live in a multi pet home checking each pet individually is recommended, even if they’re not itching. Fleas jump from host to host regularly; if you’ve got them on one pet chances are your others have them as well. What Do Fleas on a Dog Look Like? When it comes to checking your dog for fleas the first thing you need to know is how to identify them. Adult fleas are small, flat bodied insects that appear in various colors from reddish brown to black. 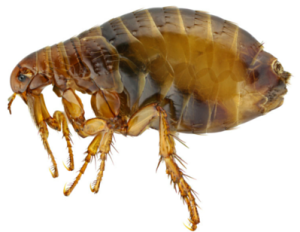 Fleas are extremely small ranging in size from only 1/16 to 1/8 (1 – 2.5 mm) of an inch long. They’re wingless, though they’re known for their extraordinary ability to jump large distances thanks to their 6 long legs. These long legs and speed are what makes fleas so troublesome to our pets; they’re able to evade your dogs teeth and claws. Depending on your dog’s coat length and color fleas can be hard to find with the naked eye. 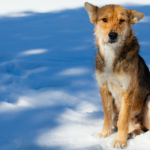 Darker, thicker fur can make finding fleas on your dog tricky. And because they move quickly and jump around they’re not always easy to spot. Because fleas are hard to find you can rely on the presence of flea dirt to determine whether or not your dog has fleas. Flea dirt is actually flea poop, and it appears as specks of dirt on your dogs skin. If those specks turn a reddish brown color when they get wet you know you’re dealing with flea dirt. Being able to catch a flea problem early will save you a lot of hassle. Left untreated fleas can turn into a heavy infestation, and that makes management more difficult. And remember that when the weather heats up our dogs are even more susceptible to getting fleas, especially if they spend a lot of time outside. So if your dog spends a lot of time outdoors checking fleas should be part of your daily routine. Once your used to checking for fleas it’s a really quick and simple process. How do you know if your dog has fleas? If your dog is itching more than normal it’s a good idea to look them over for any signs of fleas. Here’s 3 simple methods you can use to check for yourself. The best way to check for fleas (especially if your dog has dark or thick fur) is by using a white towel or sheet. To test my dog Laika I have her lay on her side on a white towel while I brush her. If I see any specks of dirt or dark spots falling off onto the sheet I know I’ve got a problem. Adult fleas are easy to identify on a white sheet. If there’s a lot of specks falling off of your dog you might be dealing with “flea dirt.” Flea dirt is a mix of blood and flea poop, and they look like small specks of dirt. If you dampen those specks and they turn reddish brown you can be fairly certain that they came from fleas. Here’s a great video that covers using a flea comb and a white towel. Adult fleas are small (1/16 – 1/8 inch) and they move fast. If your dog doesn’t have a heavy flea infestation you probably won’t even notice them unless you’re actively looking. And again, your dogs coat color and thickness can make visual checks for fleas a challenge. If you’ve ever tried to do a visual check on a black dog with thick fur I’m sure you know how difficult a visual test alone can be. To perform a visual check have your dog lay on his side or back and start with his abdomen. If you spot any dark spots that look like dirt you’re likely looking at flea poop. Adult flea feces appear as specks of dirt on your dog that resemble black pepper. If you find what you suspect to be flea dirt on your dog grab a damp paper towel. Rub the towel over the specks to see if they change color. Flea feces turn reddish-brown when they get wet. If you live in a region where your dog is at risk for getting fleas I recommend getting yourself a flea comb. Don’t bother trying to pick off fleas individually when you can buy an inexpensive item that does a much better job. We use this flea comb that has a double row of teeth. It costs less than 5 dollars and it works great on my dog with medium length hair. Because the fleas get trapped between the rows of teeth make sure you have a bowl of hot water nearby to dunk it in after each swipe. You can try killing them yourself by squashing them, but they can jump pretty far so they have a tendency to escape. Dunking them in hot water is the easiest and most effective way to make sure you get them before they have a chance to jump away. 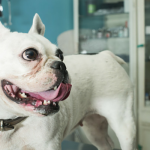 What to Do If You Find Fleas on Your Dog? If you have a puppy and find fleas I suggest taking them to the vet for treatment. 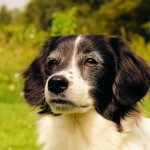 It doesn’t take long for fleas to cause anemia in young dogs, and left untreated it can be fatal. What If Your Dog Itches But It’s Not Fleas? You might not be able to catch all flea infestations yourself. 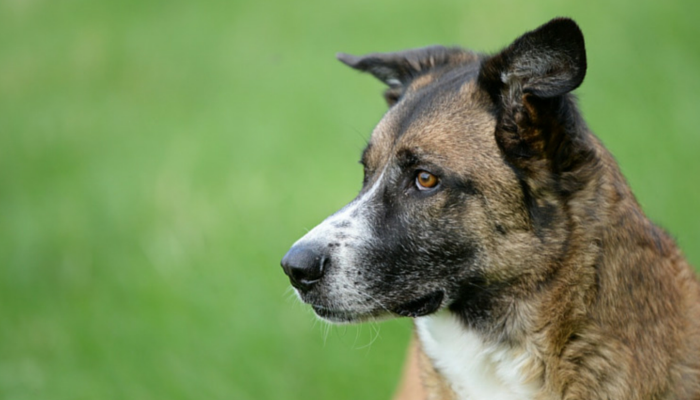 There are numerous other conditions and reactions that could be causing your dog to itch. I recommend a trip to your veterinarian to figure out what’s causing all that itching and scratching. Regardless of the diagnosis an itchy pet is uncomfortable; a trip to your vet will help ease their discomfort and find the root of the problem. How Can You Tell if You Have a Flea Problem? Disclosure: I am not a veterinarian. The purpose of this article is to teach you how to check your dogs skin and fur at home by adding it into your regular grooming schedule. If you have any health concerns about your dog the first thing I recommend is a trip to the vet. Yuck fleas. Luckily brown dawgs are not all that susceptible but we worry about ticks so we have our flea and tick topical ready for the season. We need it on the farm we will be training on. It is tick heaven! We’ve had fleas on all our animals a couple times since moving to San Diego. I never had to worry about fleas prior to moving here and didn’t even really know what they looked like. I didn’t even think of ever putting spot-on treatments on my indoor cats but now I have to. I just have no choice. If we go even two weeks extra between doses, the fleas arrive. So I just treat all my pets monthly, unfortunately. I like your idea of using a white towel or sheet for checking fleas on darker animals. I’ve never actually seen fleas on Ace or my cat Scout because they are mostly black. But they’re easy to spot on my blond cat Beamer. A good reminder now that the weather is starting to warm up in a lot of places! Please do not think I’m stupid… I now want others to learn from my mistake. Do NOT buy flea drops for cats to use on your dog. I have a small do so I thought it would be ok.
NOT ok, it actually can kill your pet, more toxic the other way – fleas drops for dogs on a cat is very bad. Although 8ts not good and im hoping this will help out someone else who thought as I did. Small dog , so I thought I could buy drops for cat… I wasted money and could of made my Buddy very sick. Thank God Buddy is okay, still scratching but he’s alive. ??? ?